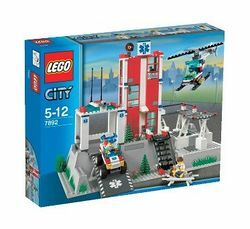 7892 Hospital is a City set released in 2006. It contains a hospital, a helicopter, a car and four minifigures, including a doctor, a patient and two medics. The hospital is built onto a raised baseplate, which was also a part of the police station from 2005, and has 3 floors. The first floor is the office, the second is the patient room; with two beds, and an infuse tool, next to the patient room is a small hallway outside that brings you to an helicopter platform (or in the worst case otherwise), and the third and final floor is the operation room. The operation room is the strangest floor and contains a brancart as operation table, and an strange array of tools: a surgical instrument (used as hands for Doc Ock's arms, and for robots from Exo-Force), and both a chainsaw and a buzz saw. This is a description taken from LEGO.com. Please do not modify it. The City Hospital is ready to help! When someone is sick in LEGO City, the staff of the City Hospital jumps into action! With three floors of medical rooms and equipment, a rescue helicopter and EMT truck, there's no emergency they can't handle! Includes doctor, patient and 2 rescue worker minifigures with lots of accessories! Includes rescue helicopter and EMT truck! Hospital has three floors of exam rooms! The City Hospital is ready to help! When someone is sick in LEGO City, the staff of the City Hospital jumps into action! With three floors of medical rooms and equipment, a rescue helicopter and EMT truck, there's no emergency they can't handle! Includes doctor, patient and 2 rescue worker minifigures with lots of accessories! Includes rescue helicopter and EMT truck! Hospital has three floors of exam rooms!